Fresno State will post its campus flags at half-staff Sunday, Sept. 11, Patriot Day, to remember and honor the 2,996 people killed and over 6,000 injured — including two Fresno State alumni — in attacks by terrorists on the United States 15 years ago. U.S. Navy Lt. Cmdr. Otis Vincent Tolbert Jr, a former Bulldogs football player, was killed the morning of September 11, 2001 when the passenger plane American Airlines Flight 77 was crashed into the Pentagon where he worked for the U.S. Navy. Shortly after, Mr. Todd Beamer died when another jet, United Airlines Flight 93 that was being steered toward Washington, D.C., crashed into a field in Pennsylvania after its passengers, led by Beamer and his now famous “Let’s Roll” battle cry, tried to overcome the hijackers. Earlier that day, the first two planes, American Airlines Flight 11 and United Airlines Flight 175, were crashed into the North and South towers of the World Trade Center complex in New York City. 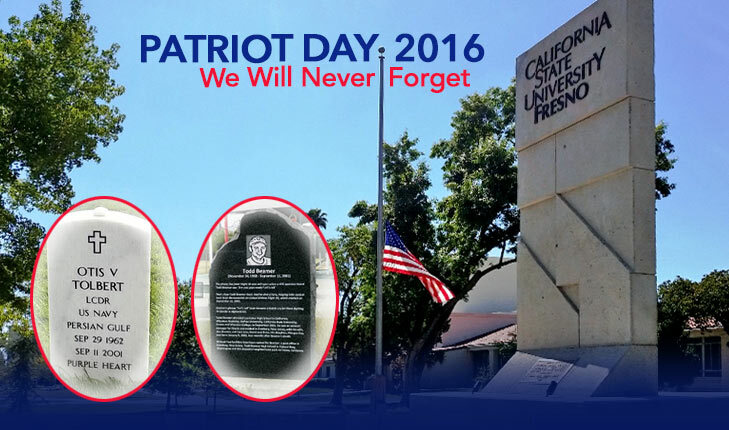 Fresno State’s annual flag tribute observes President Obama’s proclamation of Patriot Day and National Day of Service and Remembrance. The campus flags that will be posted at half-staff are located at the Save Mart Center (on Shaw Avenue, east of Chestnut); the Rose Garden near the Veterans Monument and the Thomas Building; in front of the North Gym; and at Athletics venues where events are hosted by Fresno State. In the Peace Garden, two Canary Island pine trees were planted in their memory on the first anniversary of the attack in 2002. Provided courtesy of Tree Fresno, they are located on the south side (by the Henry Madden Library) near the Cesar E. Chavez monument with markers noting their sacrifice. The second memorial is at the Bulldog Walkway on the north side of the Save Mart Center where two markers were dedicated to them on Oct. 27, 2004. Lt. Cmdr. Tolbert, a Lemoore High School graduate who played for the Bulldogs football team from 1980-83, died when a hijacked airplane was flown at 9:37 a.m. into a section of the Pentagon. He has also been honored at Bulldog football games. A seven-mile stretch of State Route 198 from Lemoore High School to the Lemoore Naval Air Station has been designated the Otis Vincent Tolbert Memorial Highway. Lt. Cmdr. Tolbert is interred in Arlington National Cemetery, near the Pentagon. Todd Beamer Park is located at 9797 N. Maple Ave. in northeast Fresno. 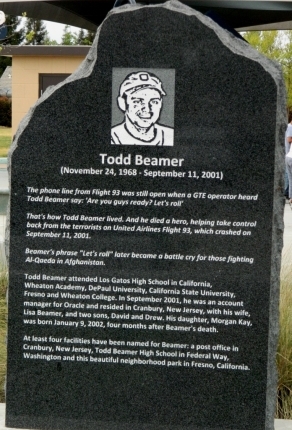 Todd Beamer Park at Maple and Plymouth avenues in northeast Fresno also memorializes Mr. Beamer and a 2006 Universal Pictures’ film, “Flight 93,” portrays the tragedy.